Remember when you used to gaze into your partner’s eyes? Time stood still. Birds sang. Flowers danced. It felt like you were living in a musical. But then time started moving again and life got busy. To-do lists got longer. Eye gazing took a back seat to things like iPads. Honestly, when was the last time you slowed down and looked into your partner’s eyes? When did you last gaze at one another? Chances are it’s been a while. The weekend is upon us and I’ve got a little invitation for you. Take ten minutes this weekend to quietly look into your partner’s eyes. “What? Ten minutes?” you might be thinking. 1. You have no idea who your partner is. I’m not saying that to scare you. I’m saying that to remind you that you are in a relationship with an ever-changing, infinitely mysterious and amazing being. When you really look into his or her eyes, you can feel this infinite amazing-ness. 2. You have no idea who you are. You’re also an ever-changing, infinitely mysterious and amazing being. If you don’t pause and feel this within yourself, you might miss it. By pausing to gaze with acceptance at the one you love, you will see yourself more clearly. 3. You can download a free guided meditation. 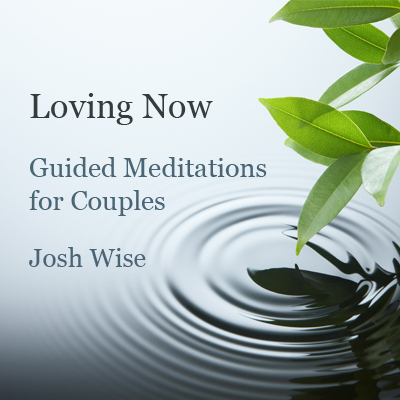 This free guided meditation will guide you and your partner through this. If you’re a little uneasy about sitting down and looking into your partner’s eyes for ten minutes, I’ve recorded a guided meditation that will guide you both through the process. 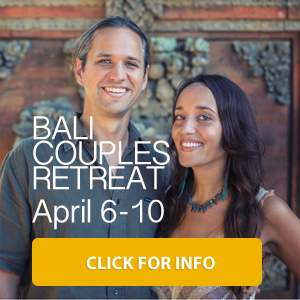 You can download the couple meditation by clicking here. This type of meditation is called Eye Gazing. The practice is simple. Sit across from one another and gaze into one another’s eyes. You might wonder which eye to focus on. Don’t worry about that—just choose one and stay with it. It’s not a staring contest; it’s ok to blink. It’s ok to laugh or to giggle or to cry. It’s ok to sit quietly and simply look. Notice what arises within you as you sit and gaze into the eyes of your beloved. Notice where your mind tries to go. Notice if there’s an urge to grab your phone. Notice if you have the urge to look away. Whenever your mind wanders, bring your awareness back to your eyes and gaze with awe at the wonder you are beholding. This is an intimate practice. Something sacred and intimate awakens when you look in this way. It takes vulnerability to really look. It takes vulnerability to allow yourself to be seen. This requires courage. Allow your eyes to talk. Allow your hearts to communicate. Allow your souls to connect. The eye is the window to the soul. I believe this is true in two ways. First, when you look deeply into the eyes of another human being, you glimpse the part of them that is pure wonder without end. Second, when you look deeply into the eyes of another human being, it opens a window to your own soul. Your partner’s eyes serve as a reflection of the beauty, complexity, and divine humanity that exists in you. Try it for ten minutes. Turn all of your attention to one another for this small window of time and notice how you feel. It’s a simple, intimate meditation that you and your partner can practice at any time (except when you’re driving). If you want to listen to the Eye Gazing guided meditation, you can download it here for free. Let me know how eye gazing goes for you and your partner. This entry was posted in Couples Meditation, Mindfulness. Bookmark the permalink.